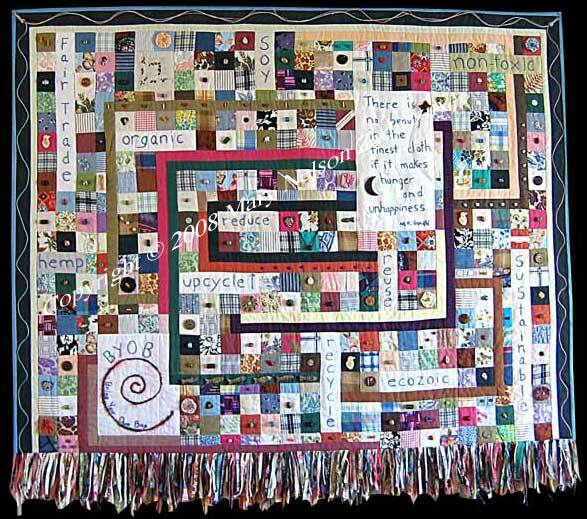 Quilt Description: As I studied the effects on our environment of the quilting process and the materials I use regularly, I created a "sampler" of eco-friendly alternatives. At first I thought the options would be limiting, but it actually turned out to be a very creatively stimulating process. This quilt took 175 hours to complete and features a pieced back as well. Materials: Organic Cotton, Hemp, Bamboo Blend, Vintage Linens, and Recycled Clothing. The batting is eco-friendly 50% PLA fiber/50% cotton from Eco-Craft. Embellished with over 190 organic beads, buttons and trims including: recycled sari silk yarn, hemp twine, beads made from lava, recycled glass, wood, carved bone, dalmata seeds, recycled vinyl disc beads (from old record albums), plus many others. All materials were intentionally chosen because of their association with "Fair Trade" practices. The fringe along the bottom was constructed with small pieces of fabric and yarn that were trimmed off during the construction process and would normally be discarded. Techniques: Machine Pieced, Hand-Embroidered, Hand-Quilted. Seams were pressed with wood iron (non-electric) whenever possible. All embellishments were attached by hand. 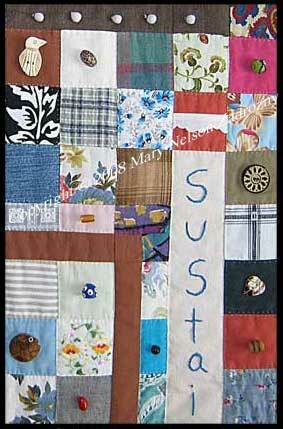 No fusible adhesives, interfacings, or stabilizers were used in this quilt. One of 11 Finalists in "Crafting A Better Planet" Competition. On display at the International Quilt Study Center & Museum in Lincoln, NE from September 5, 2008 to November 30, 2008.